La Nui means have a good trip in Hawaiian and it is the name of the guesthouse I spent three nights in in Sintra! Lanui is a family run guesthouse by Daniel and his wife. She is the creative brain and visionary of the place and he is the force that made it all possible while working another full time job! It took them a year to get the permit for this guesthouse to start working on it and making it liveable. Everything you see in there, they did it themselves. This family team have transferred the house into a stylish escape. You can see the work in progress images on their Facebook page. They are still working to transfer the back garden to a fairytale like space with beds and cushions under fruit trees and shades. I know most websites recommend a day trip to Sintra but staying there for two full days was a great way to see the city without rush. We woke up and just took our time. We started the days by making our own breakfast and eating in the guesthouse's garden then taking off to explore a different part. I would have easily stayed there for a couple extra days. The guesthouse is a shared space with shared bathrooms, but there are a three of them, so we didn't have to wait on anyone. We can just go to the other available ones. Each room is named after a famous place in Sintra, which was a cute idea and it even gave us some ideas of places to visit that we haven't considered! Having a fully equipped kitchen was nice to prepare light things in the morning. I liked the living room as well. We got to meet other travellers and chat to them. Overall, we loved the atmosphere and the space. In addition, Daniel did his absolute best to make our visit as comfortable as possible! He was very kind and helpful. He even arranged some surfing lessons for us in the nearby fishing village. Disclaimer: This was a press stay, but all opinions are my own. The building itself is just an average building, but the rooms inside the flat were beautiful! Maria, the owner of the place has put in so much effort to personalise each room with gorgeous vintage pieces that she bought and refurbished herself from antique and vintage markets. She has a great taste and all the decor ideas are her own. I loved supporting a local female who is working hard to provide and excellent service to the visitors of Lisbon. There a few rooms in the apartment with three bathrooms. The sunset shed -where we stayed- has its own bathroom. There is also a shared lounge and a fully equipped kitchen. Each room has a cute name and a little board that has the name of the country where the guests have come from! My absolute favourite thing was the recommendation folder that Maria has prepared for her guests of places to eat and visit. I tried one of the restaurants she recommended and it was as delicious as promised! The location of this guesthouse is fantastic. It is away from the touristy areas, which means the restaurants around serve really nice food with decent prices. Plus, it's not crowded at all and very accessible to other parts in the city and the airport. I would love to go back to the same guesthouse or that location when I visit again! 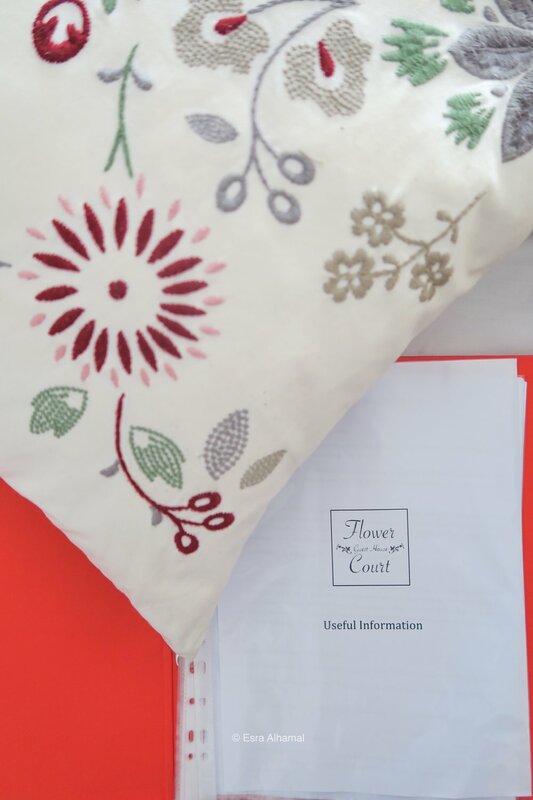 To book your room at the Flower Court Guesthouse, go to booking.com. Disclaimer: I got a press rate for this accomedation, but all opinions are my own. Over to you: Where was your favourite place you stayed in Lisbon? From Kandy, I got a tuk tuk and headed to Dambulla for the magnificent cave temples I have heard of and for the UNISCO site: Sigiriya. Unfortunately, they both didn't happen. The temple didn't let me in because of my headscarf and then I ran out of time to visit the rock, but all of that was forgotten the moment I entered Heritance Kandalama, which was just like paradise. I wish I stayed there longer, but one night was good to treat me and relax me. The hotel is very eco friendly and it's built within the forest just by the lake. It is really breathtaking and could be an amazing honeymoon hotel. They have three pools and I went to the natural floor pool. It was the most relaxing thing I have done ever. The craziest thing that happened was me forgetting to lock my balcony door! It enabled the monkeys to get in and steel my passport! It was very surreal, but thankfully the wonderful staff looked for it all over and brought it back. So, if you stay there -or anywhere in the nature in Sri Lanka- make sure your balcony and windows are locked. You can see all of that in the video below the photos. By the way, you can go to Heritance Kandalama directly from the airport. It's only three hours drive and you can even make that the starting point of your trip! It was a place to remember and the crazy monkeys just made it more memorable. It's absolutely gorgeous and I would highly recommend it. for inviting me and giving me this fabulous experience. I spent my first week in Sri Lanka in small towns and villages as you might have seen in the previous two youtube videos: Whales and Mangos in Sri Lanka and Elephants & Treehouses in Sri Lanka. It was very peaceful. I felt like I was in a world of my own, but when I arrived to Kandy I was welcomed with a wave of loud noises and insane traffic. It is the second largest city in Sri Lanka after all. After two days of being in super busy Kandy, I was invited to try a complimentary night in Earl's Regency by the Aitken Spence Hotels. The only thing I was sad about was not going there sooner! It was a true escape from the hustle and bustle of the city. It's also not too far from the main attractions. The rooms were very comfortable and the views were stunning. 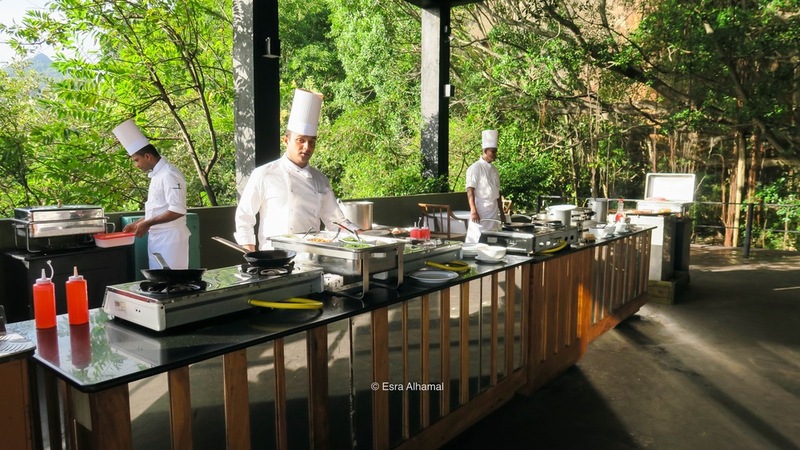 Kandy has a number of restaurants around town and there are nice ones around the lake, but I was very happy I had dinner and breakfast at Earl's Regency. There was a plenty of choice and it was all delicious. There was a live music performance during dinner as well, which added to the atmosphere. Overall, I had a very pleasant stay there and enjoyed the food and the views. It is a really peaceful escape from the very busy city. After a few hours on the train from Ella to Noneya and two fun bus rides with the locals, I finally got to Kandapola, a small village in Nuwara Eliya. The breeze was slightly colder in that part of Sri Lanka. The higher up the hill I went, the colder it got. It turns out that Kandapola is the coldest spot in the whole of the island. It is where Heritance Tea Factory is located on its own hill surrounded by endless fields of tea. I was very excited to be staying there. It is a tea factory that was converted into a classy boutique hotel. The tea factory within it is still functioning, but it was reduced in size. All the tea that is made in Heritance Tea Factory is only served and sold there. There is big machinery in the basement that works for half an hour around dinner time. It is fun to watch. My room was comfortable and I had the prettiest view of fields upon fields of tea, but it was very cold. It was like British cold like 8-10 C and I was not prepared. There was a heater in the room, but the corner rooms get even colder. I wish I had a cardigan with me, but all my clothes were super summery. The tea experiences at the hotel were my absolute favourite. You can read about them in details in the previous post: Sri Lankan Tea: from the tea leaf to the cup and even watch me participate in the youtube video: Perfect Cuppa: The story of Sri Lanka Tea. The hotel is on it's own little hill and far away from town, so it's a good idea to just eat at the hotel otherwise it will be very tricky. I also didn't see any food options on the way. The breakfast was really yummy. The staff were really friendly and suggested some authentic Sri Lankan dishes for me to try. For dinner, I had the set menu and it was so delicious with a good number of options from international to Sri Lankan food. PS. The chicken is halal. 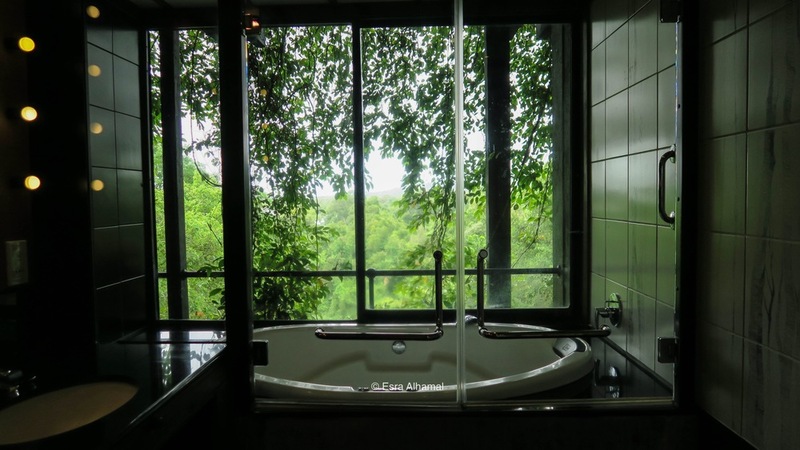 Along side the activities and the nature, Heritance Tea Factory have a spa and gym. I haven't tried them, but they seem nice. Overall, I really enjoyed my stay and the staff were exceptional. I think it's nice to go there for a day or two to relax and get some tea and lovely cold breeze. for inviting me and giving this fabulous experience. 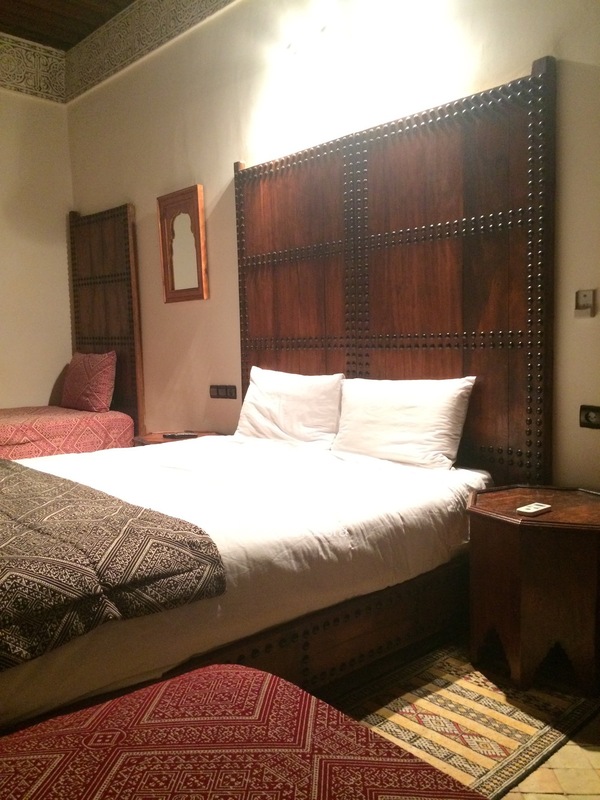 When I was in Fez, I spent a week at Riad Fes Aicha. It is a little lovely gem in Fez. It looks better than the pictures on booking.com and on trip advisor . I really enjoyed my stay there. The location was perfect. It was exactly at the taxi drop off point of the old Madina. There is a tiny alleyway that leads to it. It was straightforward though. It is close to everything. The service was great. My room was really nice. I had the top floor room next to the terrace. I loved the view of Fez from the terrace. I enjoyed their breakfast. It was a selection of breads and jams. The first half of the week I had it in the courtyard, but then on the terrace because I wanted to enjoy the view and the sunshine. They can arrange dinners and other services as well. I had a lovely dinner under the stars there. If I go to fez again, I will surly go there. I found it safe and friendly for a solo female traveller. 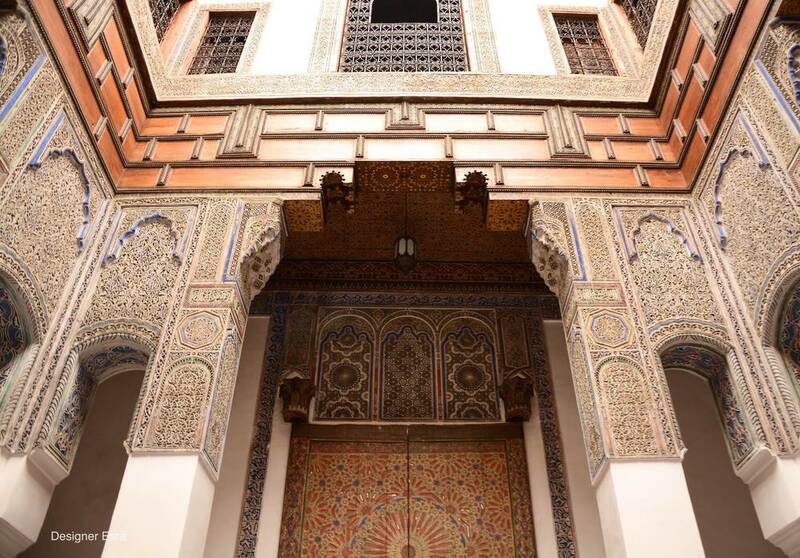 The Islamic Pattern course I did in Fez took place in the -oh- so beautiful Dar Seffarine. It was such a great venue restored by the owner Alaa, an Iraqi architect, that moved with his wife Kate to Fez few years ago. The Dar is two minutes off the Seffarine square in a tiny alleyway. Once you enter, you are welcomed with the gorgeous unexpected courtyard. There are two big rooms downstairs along with a courtyard bathroom and the kitchen. There are more rooms upstairs. I had lunch everyday of the week there and every day they served something new. Their food was delicious. It was hands down the nicest food I had in the week I spent in Fez. It was a mix of Moroccan, Iraqi and modern food. They also have a terrace with a view of the old medina of Fez. That view and their mint tea were the perfect combination for an evening of relaxation. Dar Seffarine was one of my trip's highlights. I keep recommending it to my friends. It is very suitable for a weekend, where you can just stay in the Dar away from the hustle of the Medina. I have loved looking at the stars for the longest time. When I was a child, my family and I went to Meddina. It is located in the West of Saudi and we used to take the bus to go there. The bus passed through the desert for hours taking us from the East to the West of the country. One of the strongest memories I have from those trips was the stars and how they filled the dark desert skies with sparkles. 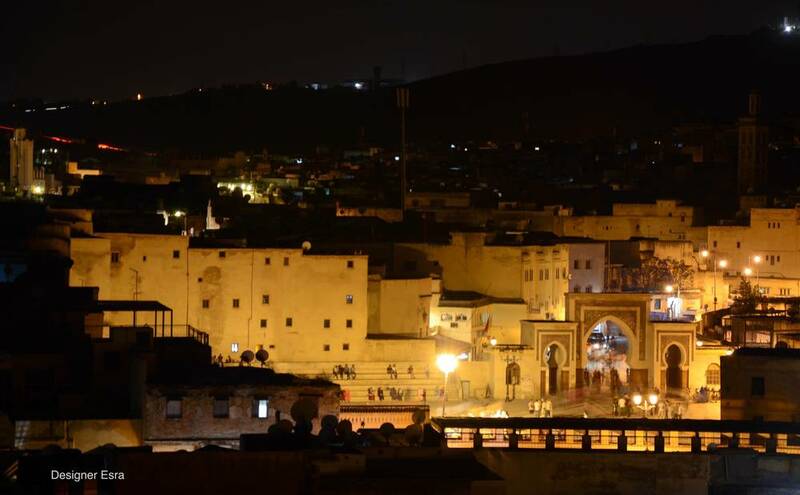 When I was in Fes, I was happy to repeat that memory and dine under the changing colours of the sky & the stars. I didn't have to go far for this experience, I just asked my hotel, Riad Fes Aicha, if I can have dinner in the terrace and they arranged an elaborate delicious one for 200 Moroccan Dirhams per person, which equals 14 GBP. It was one of my favourite nights in Fes and from that point on I was hooked on the terrace and went there for breakfast, tea and star gazing.